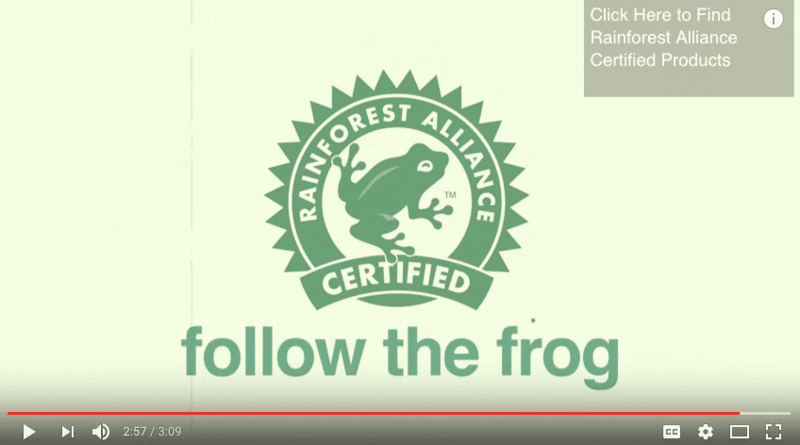 For this month’s Branding Video Spotlight, we focus on the Rainforest Alliance’s Follow the Frog campaign. Good, right? Overall, we quickly identify with the fellow in the video. It’s that relatable. 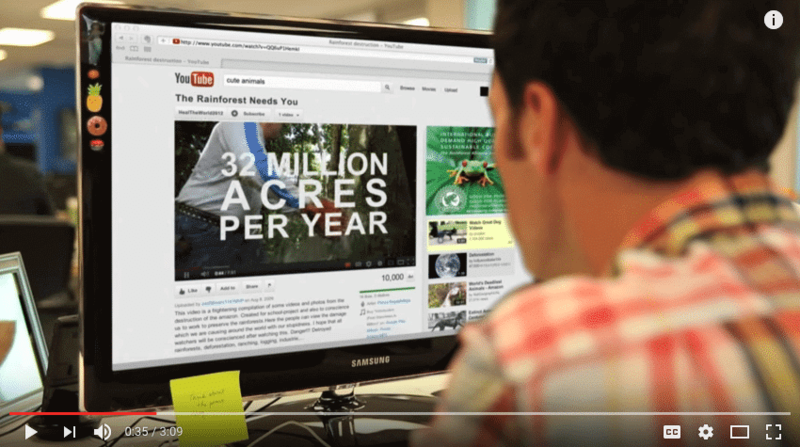 And, while the mission of Rainforest Alliance is a serious one, the video is chock-full of humor that leaves us realizing how a simple step – choosing their products that support the rainforests – can make an impact. 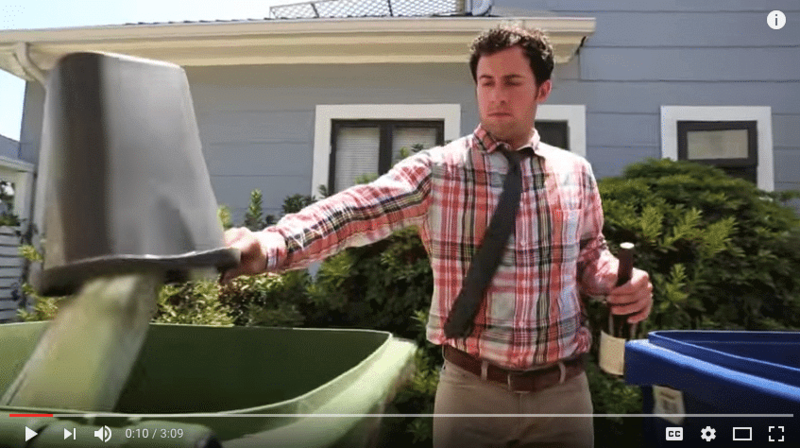 => What’s key here is that the target audience can immediately relate to this video. In fact, within 30 seconds you “become” the main character in the story. You relate to him on not just one level but on multiple levels: you are a good person and you spend time with your family, you work out, you recycle, you give to charity, you drive an environmentally friendly car when you’re not riding your bike, and you always send a card on Mother’s Day. Always. In other words, the video immediately taps into the characteristic values of its environmentally conscious target audience. 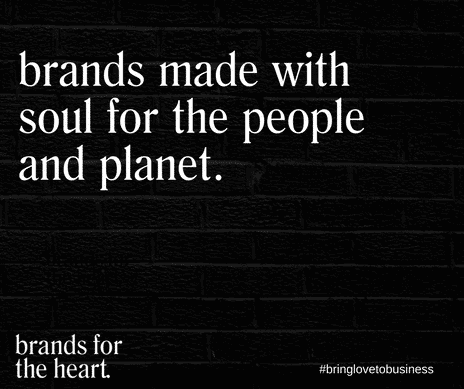 These values are then successfully woven into the story with humor and authentic language; that is, the language is in step with the Rainforest Alliance image image and in tune with their community. They have effectively combined humor and authenticity to engage and motivate their audience. Well done! Oh, and, to finish off our adventure, we’re treated to a full-circle story when our protagonist returns from the jungle. No spoiler here – just in case you haven’t yet taken your 3:10 research break. Want to learn more about how to best tell your brand’s story? : 3 Ways To Bring Your Brand’s Personality To Life. It uses relatable environments to tell the story. => They chose perfect sets for taping–living room, gym, shower, office and the rainforest itself. But notice they didn’t use just any living room, gym or shower–they chose a taping environment that reflects their community, their target audience, and is consistent with their image. At this point we also hear a dramatic shift in sound effects, which matches the shift in content as we move, temporarily, from storytelling to information delivery. Are you an impact entrepreneur, a giver with a vision to share but not sure how to get started? Check out: Are you Shying Away From the Limelight? The Impact Entrepreneur’s Journey. The logo is first presented subtly and builds to a fantastic flurry of product presentation to close the video. At the :14 mark we get the first glimpse of the logo as our fellow is munching a snack while taking a video break at the office. Then, at the :31 mark we see that same snack bag, but we also see our guy receiving the pivotal information regarding rainforest destruction. During the delivery of these statistics, the logo and the actual star of the short movie, the beloved poison dart frog, are front and center, even if not literally. And at the 1:09 mark, we meet our frog and follow it to the heart of the rainforest, where we learn of the tactics we’re not going employ to save it. While all of this is happening, there is a subtle message in the background – we see a lot of green, but not just any green. We see variations on the cool color of our frog – from the office water bottles and sticky notes to the roof of the bus to the walls as well as a roommate’s bed sheet in the El Salvadorian hospital. Green makes perfect sense, yes? They have a green movement, a green logo, and they’re targeting a largely green audience. When we see the logo splashed across the screen on a plethora of products we already purchase, we realize how simple it is to support this cause. And we want to, because, as we’re told at the beginning of the video, we are good people. To learn more about designing your unique logo, check out: How to Avoid a Frustrating Experience With a Graphic Designer When Branding Your Business and 9 Essential Logo Design Rules: Does Your Logo Pass The Test?. It effectively employs emotional hot buttons & humor like few other videos. => They’ve wrapped emotional hot buttons in humor to the nth degree – the frightening statistics coupled with the hilarious action visuals reflecting our innate desire to “do more” is genius. Remember that emotional hot buttons and humor are two key concepts to consider when creating your own branding video. To read more about creating your brand video, read: 15 Key Elements to Create a Brand Identity Video and Wow Your Crowd. They make the brand about you (not them). => Like Bombas, Rainforest Alliance lets their community members know they are the ones who create the impact, they are the ones who make a difference. In this case, by purchasing their products. Through humor they applaud the “good” we already do and acknowledge that, because we are good people, we often want to do more. To learn more about why I featured the Bombas brand video, visit: Branding Video Spotlight: How Bombas Creates a Buzz. 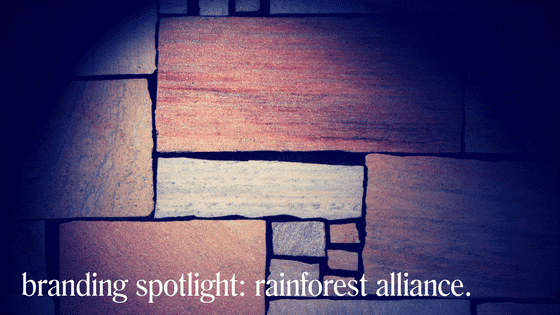 To make the call to action even more simple for us, we are shown a wide sampling of Rainforest Alliance Certified products and provided a link to locate the products near us. Read more about how to create a movement in this previous blog post: 20 Examples of How You Can Create a Movement For Your Brand. While I think this is an excellent video, I also think an argument could be made for shortening the storytelling aspect, particularly the jungle action flick segment. And it might be argued that the video is slow to introduce its product. 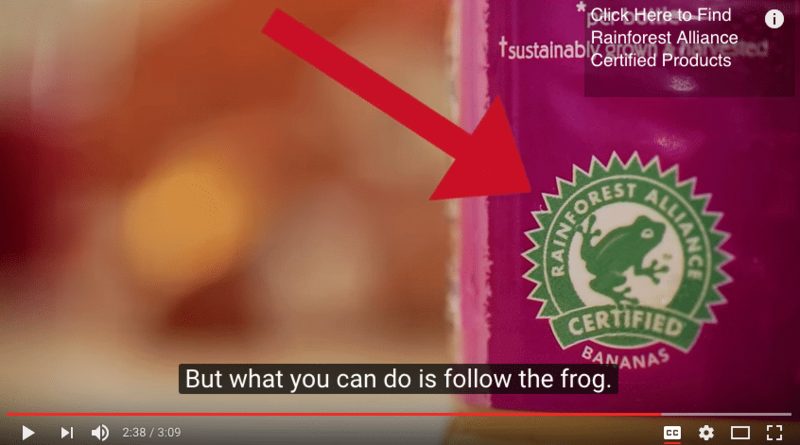 Although we do see the use of product placement at the :14 mark, it is much later in the video that we hear directly about the Rainforest Alliance. What do you think? I’d love to hear your thoughts on the Follow the Frog video. Please comment below!